Ah, there really is no place like home for the holidays. Being around friends and family is good salve for the aching soul, and the warm holiday spirit truly is infectious. But holiday gift exchanges at the Dublin House and my little cousin’s Irish stepdancing weren’t enough to distract me completely; I still found myself sneaking out at night to furtively drive around listening to Wham’s “Last Christmas” while juggling the steering wheel and a piping hot peppermint mocha from Starbucks. It was on Christmas Eve that I felt yanked out of my self-pitying slump. Judson and I had been entertaining the idea of meeting up while we were both in the States, and I suggested a snowboarding trip to Vermont. On Christmas Eve, he surprised me by saying that he was going to join me. I managed to recruit Alana for the trip as well, and a few days after Christmas, we embarked on a short but felicitous road trip up to Vermont. Prior to this trip, I had only been to Vermont twice. On the first trip, I got a concussion; on the second, I had to drive back to NJ and to the emergency room for what turned into surgery. Despite having found the Christmas pickle – which guarantees a year of good luck – , I wasn’t sure this trip wouldn’t involve a mishap of some kind. As we drove north, I wondered if I would be driving back home with a broken leg or if we’d be sleeping in the car because my room reservation hadn’t gone through. To add to the adventure, the Econo Lodge was supposedly haunted by a poltergeist with a penchant for interior decorating. Alana and Judson didn’t seem too bothered by this, but as usual, I was convinced I was going to wake up to someone floating in the room and would be unable to awaken my roommates. A reviewer from Alabama – another eerie coincidence, because how many Alabamans go to Vermont? – reported awakening in the night to find something moving beneath the bed covers. In the morning, he and his wife found the chairs stacked on top of the table. When he asked his wife if she had done it in the night, she denied it. Add to this the isolated mountain location and you have yourself a low-budget sequel to The Shining. Of course, Judson found this all to be hilarious. In the morning, we set out for Killington, a 3,000+ft peak just seven miles down the road from our haunted motel. 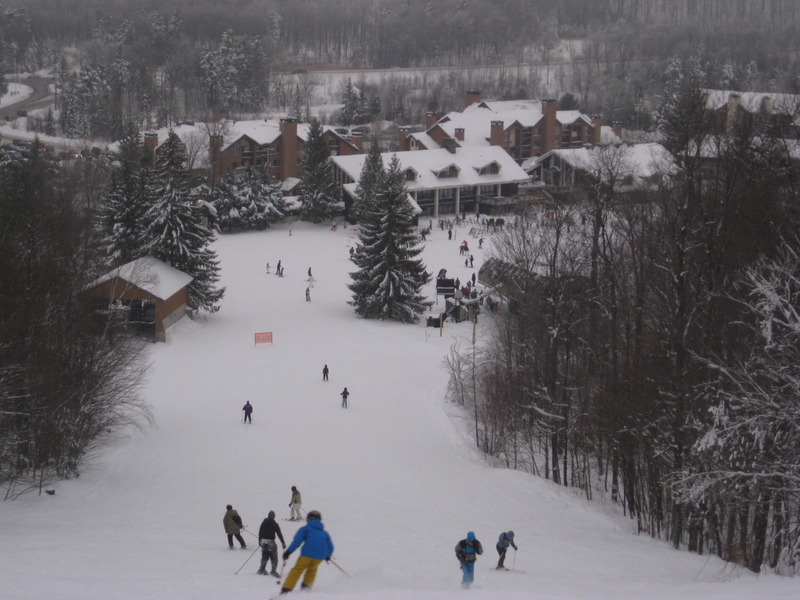 The ski area of Killington is actually comprised of Killington itself as well as a few other mountains in the vicinity, providing a plethora of different trails for riders to get lost on. 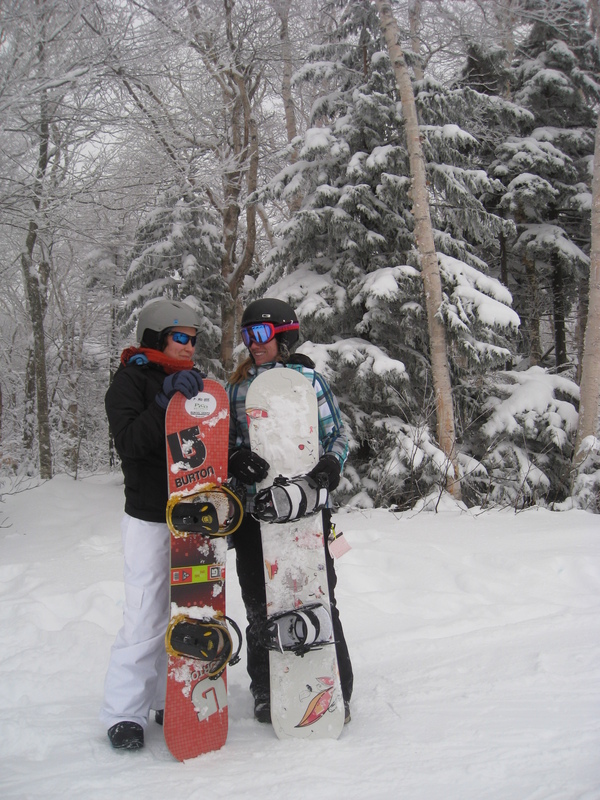 Braving the blustery winds and frigid temperatures at Killington, we strapped on our boards and got right into it. 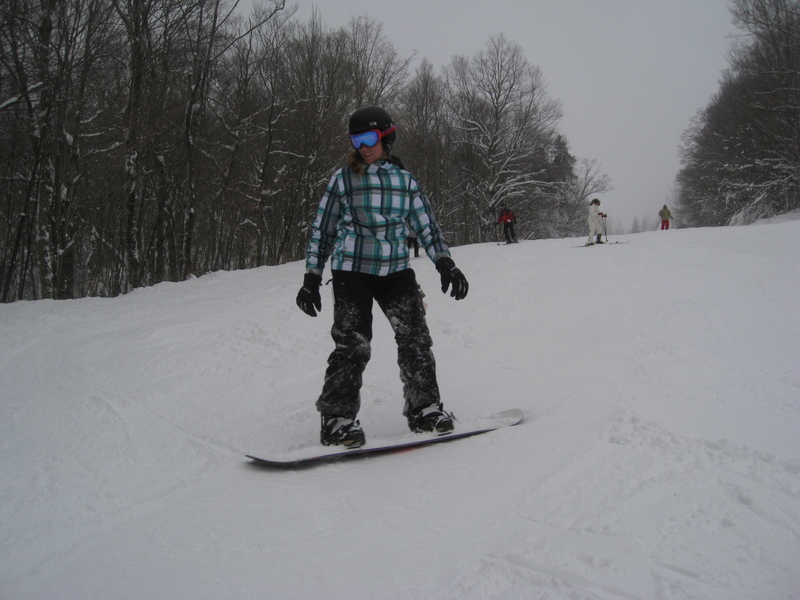 I think my unconquerable happiness began the moment I snapped my back binding on and descended down the first run. Snowboarding can be one of the most frustrating sports. It takes multiple seasons to really get the hang of it if you don’t go often. You might finish a season perfectly linking turns and carving the mountainside without a single fall and start the next season with a bruised backside and equally bruised ego. There are few words that encapsulate the sheer happiness of completing your first run of the season completely unscathed with a natural feel on the board. I was smiling from ear to ear when I met Judson and Alana outside the rental cabin at the lodge. It was only up from there. Alana had never been before, so we took her to a bunny hill and I finally got to impart some of the small arsenal of snowboarding knowledge I have. It helped that she was a natural and picked it up easily. The day took a turn for the worse – for me, anyway – when Judson and I decided to try a green run and wound up on the complete opposite side of the mountain. The run was icy and a bit cold to begin with, and all I wanted was to be back at the lodge where it was warm. Instead, we had to take the lift back up to get down to the other side of the mountain to Alana. This was quite possibly one of the least enjoyable runs I’ve ever done, and this is coming from a girl who has fallen out of a lift, been stuck in a plastic fence, had a concussion, been whacked in the mouth with a ski pole, and boarded blindly into a snowmaking machine. Judson and I took the lift back up. I buried my face in my coat, but it was futile; my nose was icy and uncomfortably numb. You could’ve given me another piercing and I wouldn’t have noticed. My hair, which had come out of its braid, was frozen. Intricate webs of ice had formed amidst the strands of hair that were exposed to the elements. Judson’s eyelashes were frozen. The wind was relentless. It blew wildly and rocked the lift violently from side to side. At one point, we stopped in front of a snowmaking machine. Then, almost at the top, we stopped again only to be viciously jarred by the wind as if it intended to rip us out of the chair. The chairlift abandoned us at the trailhead, which was unforgivably blustery. I couldn’t see a thing. Everything was shrouded in a turbid, tornado brown fog. The cold was biting. I could barely see Judson, and I was feeling both frustrated and anxious. I strapped on my board and descended. Rather, I tried to descend. I was literally on an incline, pointed downward, and suspended in place by an uphill wind that generously barraged my face with sticks and dirt. When it got icy and steep, I went down on my heels. When we hit a lengthy flat span, which was frequent, I pushed onward. Some parts of the trail found me happily snowboarding properly, distributing my weight from toe to heel perfectly, with Judson behind me on the ground. Other parts found Judson effortlessly linking turns ahead of me while I wiped out in bitter cold snowbanks. It was trying. Quite a few times, we found each other breathless and sitting on the side of the trail. At one point, Judson shook his head and said, “I’m spent.” I wholeheartedly agreed. But we made it down. Despite all of the obstacles and the disorientation and the frustration, we found ourselves back on the bunny hill. This made me feel elated for two reasons, the first being that we had successfully made it down without the aid of a snowmobile and neither of us had been consumed by roving wolves. The second upside was when I realized at some point during the day that, had this happened to me a year or two ago, I would have been in far worse condition. It wasn’t just that my skill had improved some; I used to set myself up for failure and panic and overcomplicate things, but this time, I easily accepted what we had to do and just did it without complaining or fretting or becoming exasperated. This gave me the energy for one more run, despite the fact that our misadventure had stranded Alana at the warm lodge for three whole hours. We celebrated our survival in the overly chlorinated hot tub afterwards and later with some beers. Suffice to say, the following day’s adventure was much more enjoyable and relaxing.